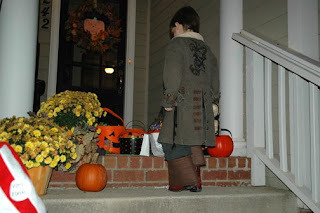 Last night was Andon's first time going trick or treating. We were invited to go with Owen and Lucas in their great neighborhood. It was such a busy place with lots of kids out all dressed up. This house just left a bunch of candy bowls out with a note to take two. So Andon is trying to decide what he wants. After trick or treating we all went back to some friends house to hang out and let the kids play. 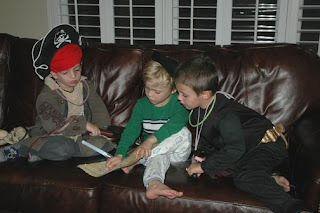 Here is a pic of the boys reading a treasure map. They had so much fun playing together. It was such a fun night hanging with new friends. The only thing missing was my sweet husband. He'll be home just in time to celebrate Andon's birthday! So glad you had so much fun! Happy Birthday sweet Andon...5 already...amazing!!! So fun, what a cute pirate! That was such a fun blog to read. My kids loved the pics. 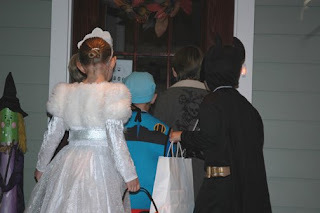 I love that you took him trick or treating with other kids. How fun! 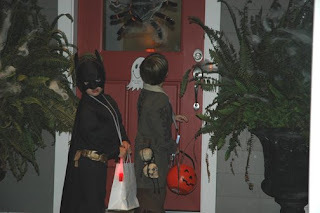 I just posted my Halloween Pics today...so check it out!